Olsen Chain & Cable offers a variety of slings that are durable and able to protect loads during moves. Slings are easy to position and offer reliability and safety. The advantage to using slings when transporting loads is the firm control and protection that they give. A synthetic webbing sling (made of polyester or nylon yarns) gives you maximum control, which makes them easy to position, and gives you a reliable, safe, and non-abrasive material. Endless slings are durable and lasting because load contact varies all along the sling. *We also offer fitting, eye, hardware and other accessory options. Every need is different. Contact one of our experts to find what works for you! Chemicals such as acids or alkalis and ultra violet light can affect the strength of synthetic web slings in varying degrees. Nylon is unaffected by oil or grease and resists many chemicals, but not bleaching agents or acids (choose polyester lifting slings instead with acids). Chemically active environments (liquids, solids, vapors or fumes) can degrade the strength of synthetic webbing slings. If your work area or objects that you will move with the nylon or polyester sling reach temperatures of 180° F (82° C) or above or dip to minus 40° F (minus 40° C), select wire rope or chain for overhead lifting equipment. Nylon tends to stretch more, so if that’s a concern, opt for polyester lifting slings. Ensure that the fitting is the correct shape and size so it properly seats in the hook or lifting device. For multiple-leg slings used with nonsymmetrical loads, have a qualified person do an analysis so you don’t overload any leg. 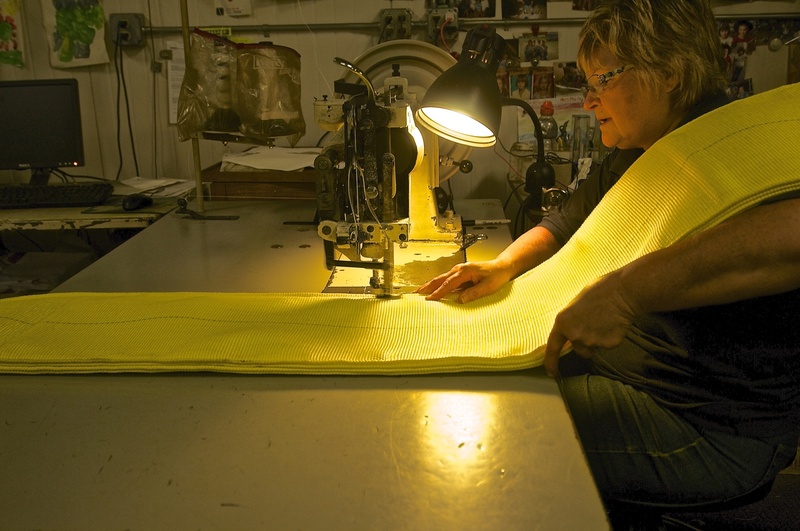 Select multiple-leg slings according to OSHA guidelines for synthetic webbing slings. OSHA rates loads based on material strength, design factor, type of hitch, angle of loading, diameter of curvature over which the sling is used and fabrication efficiency. Never exceed the working load limit and avoid shock loads. Refer to OSHA guidelines for synthetic webbing sling rated loads. Still not sure of which sling to choose? We found this to be very helpful! Do not use synthetic web slings with loads above the rated load capacities on the tag. Do not drop a sling equipped with metal fittings. Ensure that each person who will use your synthetic webbing sling knows and follows its type of load, hitch and rated load capacity. Remember to consider the angle of lift. Make sure slings with fittings used in a choker hitch are long enough to ensure the choking action is on the webbing, not the other fitting. Contact us for clarification. Follow other safe operation procedures, including selecting the right sling, keeping people safe distances away from the sling and its load during movement, properly rigging loads and inspecting all slings daily and according to OSHA-approved ASME guidelines.